Represent yourself as a DETAILER everywhere you go! Simply put, the greatest detailing shirt ever! Also available as a warm hoodie! 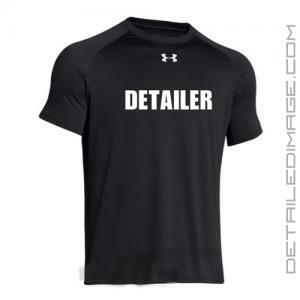 Represent being a detailer in style with the Under Armour Detailer Shirt! At Detailed Image we are always excited to promote the detailing industry as not only a profession, but as a great hobby as well. The word DETAILER is placed across the chest in big bold letters with the iconic Under Armour logo atop. This draws attention to the front of the shirt and shows everyone your support for the detailing industry and the passion we all share, making our cars stand out above the rest! On the back you will find the DetailedImage.com logo as well. With the soft and comfortable Under Armour HeatGear fabric you can detail in comfort. The high quality fabric features a loose fit and will help wick away sweat from your skin, keeping you cooler in even the highest summer heats. Might this be the greatest detailing shirt ever created? Well, it is worn by Renny Doyle of Detailing Success, Zach McGovern of Attention to Detailing, Ian Howard of GlossAngeles, Jason Whiteley of Sonax USA, Steve from Poorboy's World, Joe Metlow of Next Level Detailing, Scott Dodson from 303, Greg Gellas of Signature Detailing, and many more. Check out the link below for some awesome photos of everyone wearing this shirt. No matter if you run your own business, work in the industry, or are a rugged weekend warrior, detail in style with the Under Armour Detailer Shirt! Do you want to see Renny Doyle, Ask-A-Pro Authors, and many other people wearing this DETAILER shirt? 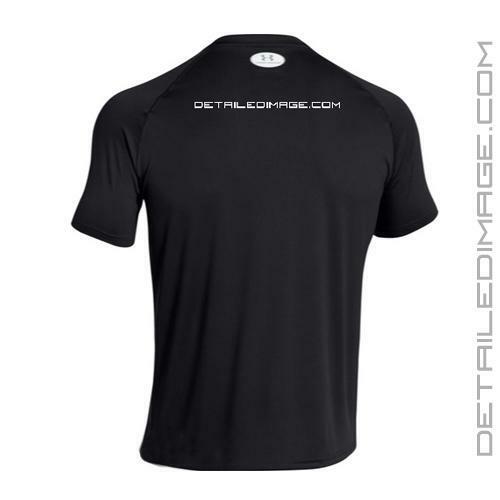 Check out the DETAILER shirt page by clicking here! Sizing Information: This is a loose fit, athletic material, shirt. It runs slightly small in size, so we recommend going up a size of you like your shirts to fit more on the loose side. Detailing in colder months or just want to stay warm? The Detailer Shirt is also available as a hoodie! I love this shirt! When the shirt gets wet it dries very quickly and wicks moisture. This is my favorite shirt I own, the fit is perfect (Size large, I am 6'2" and 200lbs) and it is very comfortable. I have 3 of them now! Such a great shirt! I always hate when my shirt starts sticking to me as I work and this shirt does not stick at all. Very comfortable. Fits great and looks great. Easy way to look professions and still remain comfortable and casual.